Democracy has in the UK has been lost, that is the view of a former policeman David Pattenden. 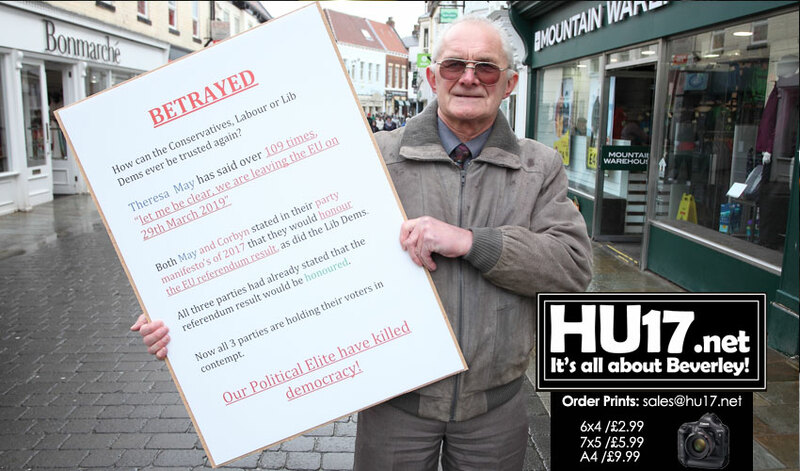 The 70-year-old from Beverley was out in the streets making his feelings clear. Mr Pattenden who voted to Leave the EU also fears that the UK’s failure to deliver Brexit could leave the door open to far-right radical groups. Mr Pattenden was conned by David Cameron into believing that if the electorate voted Leave, that we would leave. If he had listened to those of us who were opposed to having a referendum he would have understood it was a false prospectus based on a proposal which was meant to serve the interests of the Conservative Party and not the country which is why we are in this mess. As for Labour, we’re in opposition. We don’t have power and until 2 weeks ago, were frozen out of the negotiations by Mrs May.